Alaria esculenta is an edible seaweed, also known as dabberlocks or badderlocks, or winged kelp. It is a traditional food along the coasts of the far north Atlantic Ocean. It may be eaten fresh or cooked in Greenland, Iceland, Scotland and Ireland. It is the only one of twelve species of Alaria to occur in both Ireland and in Great Britain. Grows to a maximum length of 2 m. The whole frond is brown and consists of a distinct midrib with wavy membranous lamina up to 7 cm wide on either side. The frond is unbranched and tapers towards the end. The base has a short stipe arising from a rhizoidal holdfast. The stipe may bear several sporophylls which are club-shaped and up to 20 cm long and 5 cm broad which bear the spores. It grows from a short cylindrical stipe attached to the rocks by a holdfast of branching root-like rhizoids and grows to about 20 cm long. The stipe is continued into the frond forming a long conspicuous midrib, all other large and unbranched brown algae to be found in the British Isles are without a mid-rib. The lamina is thin, membranous with a wavy margin. Sporangia grow in club shaped narrow leafy outgrowths produced near the base growing from the stipe. These grow to 20 cm long and 5 cm broad. Alaria esculenta is well known in Ireland, where it is known as Láir or Láracha, and in the rest of the British Isles save the south and east of England. It is perennial. It is a common large algae on shores where there is severe wave exposure attached to rocks just below low-watermark in the "Laminaria belt", and is common on rocky shores in exposed places. It has a fairly high intrinsic growth rate compared to other algae, 5.5% per day and a carrying capacity of about 2 kg wet weight per square meter. It may reach lengths of about 2.5 m. It overlaps to a small degree (+) in distribution with Fucus serratus and somewhat more with Laminaria digitata. It has low and high light limitation values of about 5 and 70 W per square meter respectively. Its distribution is also limited by salinity, wave exposure, temperature, desiccation and general stress. These, and other attributes of the algae are summarized in Lewis (1964) and Seip 1980. Leaf-like sporophylls develop from the stipe and produce zoospores. A. esculenta may produce phlorotannins and oxidized lipids as protective functions against high photosynthetically active and UV radiations. Europe: Greenland, Iceland, Faroes, Norway, France, Helgoland, Netherlands. North America: Alaska, Labrador and Massachusetts. ^ a b Newton, L. (1931). Handbook of the British Seaweeds. British Museum (Natural History), London. ^ Basic information for Alaria esculenta, Marine Life Information Network (MarLIN), retrieved 1 October 2007. ^ Fritsch, F.E. (1945). The Structure and Reproduction of the Algae. Vol. 2. Cambridge University Press, Cambridge. ^ Lewis, J.R. (1964). The Ecology of Rocky Shores. The English Universities Press Ltd.
^ J. R. Lewis (1964). The Ecology of Rocky Shores. English Universities Press, London. Gordillo, Francisco J.L. ; Aguilera, José; Wiencke, Christian (2015). "Ocean acidification modulates the response of two Arctic kelps to ultraviolet radiation". Journal of Plant Physiology. 173: 41–50. doi:10.1016/j.jplph.2014.09.008. PMID 25462077. M. Indergaard & J. Minsaas (1991). "Animal and Human Nutrition". In M. D. Guiry & G. Blunden (ed.). Seaweed Resources in Europe. pp. 21–64. ISBN 978-0-471-92947-5. Olischlaeger, Mark; Wiencke, Christian (July 2013). "Seasonal fertility and combined effects of temperature and UV-radiation on Alaria esculenta and Laminaria digitata (Phaeophyceae) from Spitsbergen". Polar Biology. 36 (7): 1019–1029. doi:10.1007/s00300-013-1325-5. 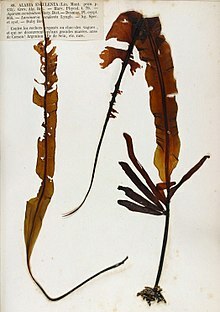 "Alaria or edible kelp (Alaria esculenta)". Grand Manan Island, New Brunswick. 2004-05-30. Archived from the original on 2005-05-18. M. D. Guiry & Wendy Guiry (2006-08-30). "Alaria esculenta (Linnaeus) Greville". AlgaeBase. This page was last edited on 7 September 2018, at 18:17 (UTC).